Since I had to be at school this week for Valentine's parties, Star of the Week (more to come there) and Birthday Lunch, I did get a chance to get a picture of the Cub of the Month wall. 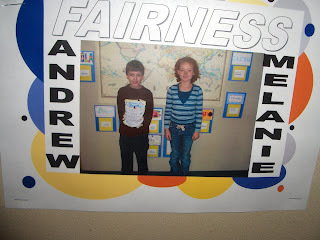 Here's a picture of the two Cubs of the Month in Andrew's class. We're very proud of Andrew for receiving this honor.